The Incredible reason why your dog's nose is dragging you around town! 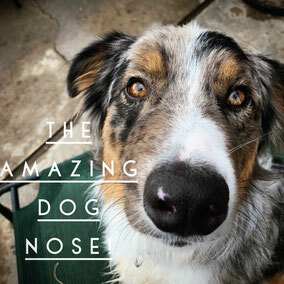 The INCREDIBLE abilities of a dog's NOSE and some insight into why your pup's nose may drag you around town! I have always been fascinated by a mammal’s senses from an orca whale to an elephant and a dog’s nose is an amazing thing worth examining. Unlike our noses, a dog really knows how to tap into their abilities and utilize them. We’ve been able to really hone in on that natural ability to accomplish some incredible things with dogs! This should also give you a great amount of insight to why certain things might be surprisingly difficult when training your dog. For instance keeping your dog from marking their territory over another smell, or calling them to you off of a strong prey smell. I get a little picture crazy on this blog so bare with me and enjoy all the cute noses! First, let’s do some human and dog nose comparisons for a general understanding. This is an average pulled from several sources. 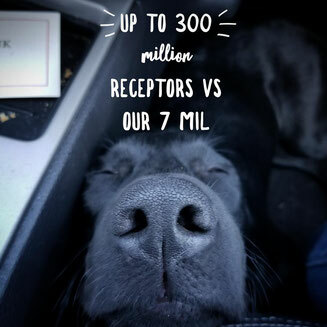 A dog possesses between 200 and 300 million olfactory receptors in the nose. Compare that to our 4-6 million and that is a startling surprise! 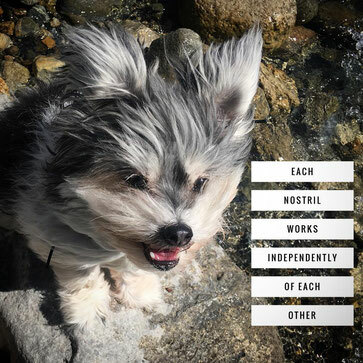 So for some perspective, in Alexandra Horowitz’s book Inside a Dog, she writes that while we might be able to smell a teaspoon of sugar in our coffee, a dog smells a teaspoon of sugar in a million gallons of water. (that is almost two olympic sized swimming pools). That is a startling ability! 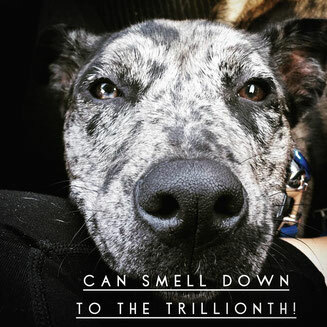 They can truly detect certain smells, especially chemicals, down to the trillionth! This is why drug sniffing is such a natural ability for dogs to learn. The reliability relies on the training itself of course, but the nose is capable! You might be able to smell some amazing stew with beef and onions and garlic. Your dog can tell much more down to how fresh the meat is, each individual herb, spice and veggie. Think about when dogs say hi to each other with some sniffing. They are getting things like the age of the dog, the health, if he lives locally and what kind of food he eats. Very impressive for a first meeting! 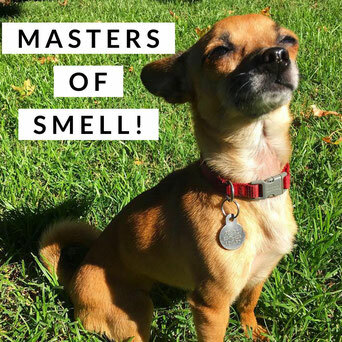 The olfactory receptors I just mentioned go even further for a dog and allows them to smell liquid layers of chemicals (a perfect example being several dogs urine marking over the same spot) It sends that scent information to a part of their brain that is made for processing smells We have that too! The difference is their part of the brain that does that is 40 times larger then ours! That alone tells you how seriously evolution takes those dog smelling abilities. A dog’s nose pick up on emotion easily. As a trainer this is really the part I love learning about. 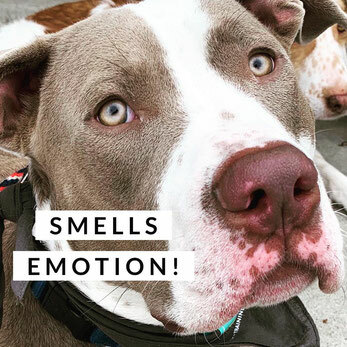 Their sense of smell picks up on many emotions because of their animal instinct and the fight or flight response. This means when a person is anxious, sad or fearful, a dog knows it and can read many people at one time. Add body changes to that like hormones and heart rate, that layers on to what their nose is already telling them and they will act according to that. Dogs pick up so much info at one time that a protective dog that senses the owner being very soft in a loving moment will naturally heighten his instincts and awareness until his owner is paying more attention again. All of this is pheromones they smell, body language, breath, tone of voice and body language. They have so much information to process, as a dog trainer that is why we see so many dogs make mistakes on what they think they are reading. The way a dog’s nose is designed is a work of art in and of itself. Each nostril works separately and breathes in and out at one time. This sounds crazy! haha We breathe in and then we exhale. That would be boring to a dog. 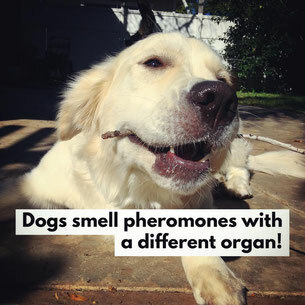 They do both simultaneously and separate the air so they can smell and breathe in two different areas. 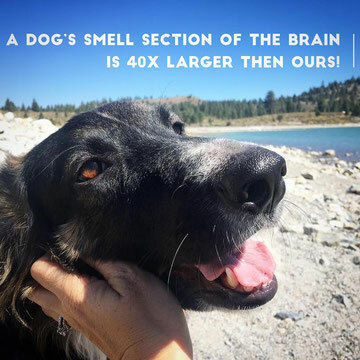 The scents in the air go to the olfactory receptors transmitting to that special part of the brain and the air goes where it needs to for the dog to breathe. If it sounds like I’m over-simplifying it I am so I understand it without getting technical. It is fascinating to look at charts and dive deep into how this works and I encourage you to do so after reading this. Smelling pheromones is a whole other part of the conversation because it is actually a separate nasal organ that acts and works separately. One that humans don’t have. To look more up on that organ it is called the Jacobson organ. I hope this article inspires you to understand your dog better and what they are going through. It is also a balance of letting them enjoy life with their nose without letting it completely take over their life. Balance in life is always tricky and apparently it’s no different for a dog and his nose. I hope everyone will look even deeper into what makes a dogs nose operate among other species including us humans! Click here to see more testimonials after seeing our transformation and testimonials page.